Graphic Designers are closely concerned with how the shape and form of typography can either assist or hinder the flow of reading. At their disposal are millions of typefaces, a fixed amount of whitespace, and techniques such as leading, kerning, tracking, point-size and so on. But what exactly is 'the flow' of reading? The flow of reading printed matter is a simple process which involves 'trivial' extranoematic effort. In other words, it's about moving one's eyes along lines of text, absorbing the meaning, and then turning pages. The words supply us with the visual and imaginative stimuli, and the form of the lettering is what draws us along each sentence. In advertising, magazines, direct mail, animation, and poetry, text can of course be displayed in all sorts of 'non-trivial' ways, where straighforward horizontal reading is broken up or even abandoned. Some novels also present type in this way. They tend to be a lot less common and are generally considered 'difficult' if they are well-known but hardly read, or 'cult' if they are less well-known but probably more read. These sorts of novels are referred to as 'ergodic' literature, where nontrivial effort is required to allow the reader to traverse the text. 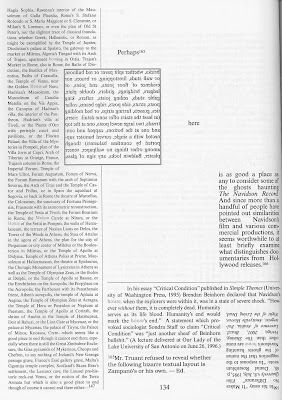 The typesetting and the text layout places a responsibility on the reader to re-align the pages, or use an extra level of effort to read the text. One example I referred to recently was Markus Kutter's 'Schiff Nach Europa' - an obscure novel written in 1958 whose main claim to fame is its amazing cover and typesetting, designed by Swiss Style supremo Karl Gerstner. 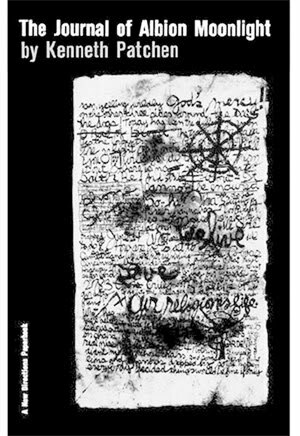 Two other better-known (and brilliant) examples are 'The Journal of Albion Moonlight', by Kenneth Patchen (New Directions, 1941) and 'House of Leaves' by Mark Danielewski (Random House, 2000). 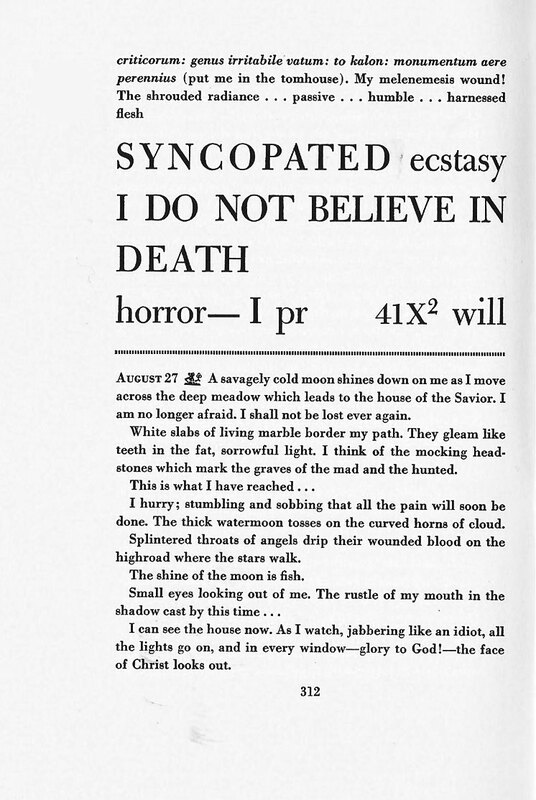 Patchen's 'Albion Moonlight' is a surreal anti-war novel that mixes poetry, monologue, sketching, and inventive typesetting into a novel which was an astounding work when it came out in 1941. It had a big influence on the Beat writers a decade or so later. Patchen went on to become a major American Poet. 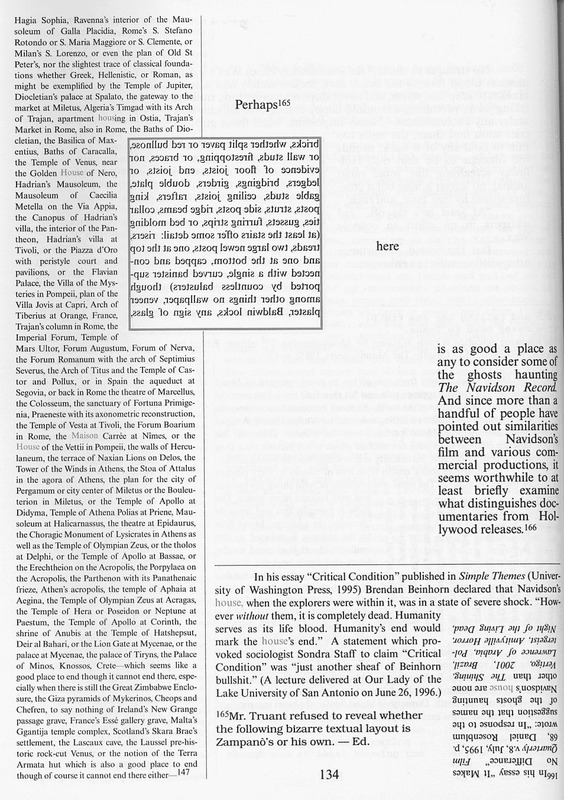 Sections of the book feature single word paragraphs, in huge pointsize type, as well as margin notes, sketches, and columns filled with different pointsized type. 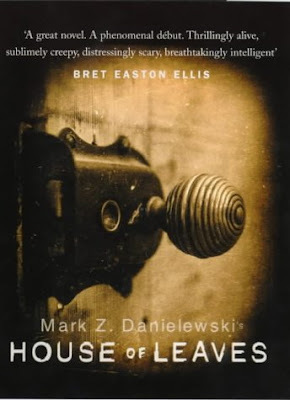 'House of Leaves' written more than half a century later, is now a modern classic, and was one of the first novels of the digital age to feature chapter releases online. The typesetting features huge tracts of blank pages, sketches, diagrams, and clipped textwrap areas. There are further examples - Joyce's 'Ulysses', 'USA' by Dos Passos, and Alasdair Gray's amazing '1982 Janine', which has a whole chapter set in diagonal and upside down text as four narrators try to talk at the same time. 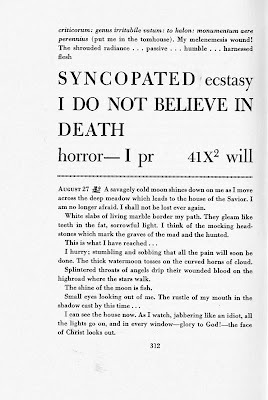 It's a pity ergodic novels are so rare, they are interesting to design, fun to read, great to look at.